None other than Miyamoto Musashi was the artist of the painting, which shows a shrike on a withered branch. Musashi is the most prominent proponent of bunbu ryodo, the “way both of brush and sword”. The term expresses that the self-concept of the samurai was not confined on being a warrior, but also included the pursuit of aesthetics and fine arts – a cultural heritage that is handed down upto now in the Japanese „arts of the Way“. The Japanese expression „sumi-e“ means “black ink” (sumi) and “painting” (e) and it is a form of art in which subjects and themes are painted with china ink in different shades of grey. In sumi-e, technical perfection or talent is not necessary; anyone can learn sumi-e when one follows the spirit of one’s teacher whose instructions are often based on intuition. The basis of practical learning is direct contact with the teacher in which the participant follows examples of his work or classical models. Genuine sumi-e is characterized by clarity and spontaneity that are transmitted directly to the viewer’s perception. Thus, for an image to be „alive“, all its components must be alive. Every superfluous detail is omitted, because sumi-e captures the essence of nature. For impressions of the last workshop see a youtube clip and a foto gallery on our homepage. There will be practiced typical aikido exercises with the bokken (wooden sword): basic techniques, partner exercises and defense against sword attacks. The focus however will not be on „fighting“ or „self defense“, but on the confrontation with oneself and an increasing blending with the sword and the movements of the partner. The time schedule will be very intense. In addition to meditation, painting and aikido, we will spend some time on both everyday and cultural activities. We will prepare meals with Beppe’s assistant Alessandro and eat together at the dojo. For more than 20 years Beppe has dedicated himself to sumi-e and zen meditation. 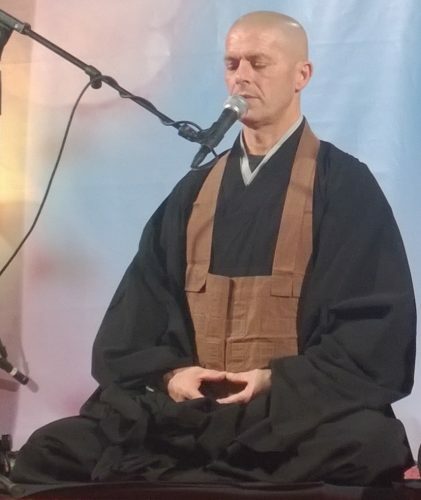 He is a sumi-e master, Soto-Zen monk and director of the Bodai Zen Dojo in Alba, Italy. His zen teacher is Roland Yuno Rech. Beppe shows his paintings and teaches sumi-e in many European countries; he lectures and gives courses for children, teens and adults on this subject. Previous knowledge of sumi-e, aikido or zen is not required! Included in the price: sumi-e teaching, aikido training, sumi-e materials, full board (zen cooking), possibility to sleep at the dojo (bring a sleeping bag!). As the number of participants is limited, registration will follow the “first-come-first-serve” principle.